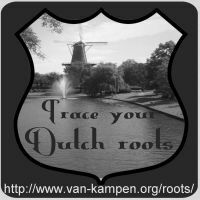 If you have studied Reading and understanding Dutch birth acts and have a copy of the Dutch genealogy dictionary, you should be able to understand most Dutch acts. As an exercise, translate the death act below. Use your dictionary and the Dutch genealogy dictionary, but try not to look at the solution below yet. The act, death act 86 of the year 1912, municipality Gorinchem, is the death act of Catharina Johanna Maria Foppen, the wife of Pieter Johannes Koopman. She lived in Woudrichem at the time, but she died in Gorinchem, in what was then district B number 130 - further research showed that this address was the hospital of Gorinchem. Woudrichem is a small city, across the river Merwede from Gorinchem. The act does not present any special difficulties. The only thing to watch out for is the time of death: ten half zes ure, litt. at half six o'clock. Half six means half an hour before six o'clock, so ten half zes ure is half past five, not half past six. This section starts with the date: In het jaar, in the year, negentienhonderd twaalf, 1912 (negentien means nineteen, honderd is hundred, twaalf is twelve, so negentienhonderd twaalf means nineteen hundred twelve, or 1912), den dertienden, the 13th (dertien is thirteen, dertiende or dertienden is thirteenth), der maand, of the month, Juli, July. It then introduces the registrar (Ambtenaar van den Burgerlijken Stand), whose name is Daniel van der Zee. He is the registrar of the municipality Gorinchem in the province Zuid-Holland. Two people appeared before the registrar (zijn voor ons [...] verschenen, made an appearance before us): Dirk den Besten, aged 55 (oud vijfenvijftig jaren, aged five and fifty years), an undertaker (lijkbezorger), and Arie Willem van Dalen, aged 38, a painter, both residents of (wonende te) Gorinchem. After the transition sentence die ons verklaarden, dat (who declared to us, that), the act describes the actual event: The death of Mr. Koopman's wife, Catharina Johanna Maria Foppen. Catharina Johanna Maria Foppen was 66 years (zes en zestig, sixty and six) and one month old, she did not have an occupation (zonder beroep, without occupation), she was born in Maastricht geboren te, born in) but living in (wonende te) Woudrichem (a town near Gorinchem, on the other side of the river), she was the wife of (gehuwd met, married with) Pieter Johannes Koopman and the daughter (dochter) of Johannes Foppen and Johanna Jansen who are both deceased (beiden, both, overleden, deceased). She died (is overleden, has died) on the 13th (dertienden, thirteenth) of July (Juli) 1912 (dezes jaars, of this year, i.e. 1912), at 5.30 a.m. (des voormiddags, before noon (or a.m.), ten half zes ure, litt. at half six o'clock, half an hour before six). The location is het huis, the house, staande, standing (or located) Eind (an address), Wijk B (district B) number 130 (honderd is hundred, dertig is thirty). The closing section of the act contains only a phrase that states that the act was read out to the appearers, and was signed by the registrar and the appearers. It is followed by three signatures. In the year 1912, the 13th of the month July, appeared before us, Daniel van der Zee, registrar in [the municipality] Gorinchem, province Zuid-Holland: Dirk den Besten, aged 55, occupation undertaker, and Arie Willem van Dalen, aged 38, occupation painter, both residents of Gorinchem, who declared to us, that Catharina Johanna Maria Foppen, aged 66 years and one month, without occupation, born in Maastricht and residing in Woudrichem, married with Pieter Johannes Koopman, daughter of Johannes Foppen and Johanna Jansen, both deceased, died on the 13th July of this year, at 5.30 a.m., in the house located at Eind, district B number 130, in this municipality. And aforementioned appearers have, after the reading out, signed this act with us. Let me know if the information helped you understand your ancestor's death acts, or share your experiences with the users of this website.